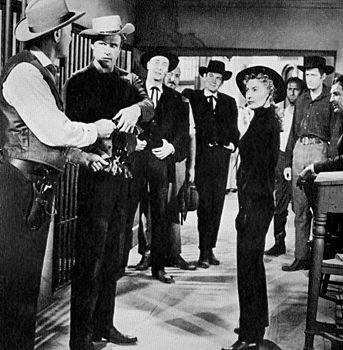 Barbara Stanwyck surrounded by men in Forty Guns. Mix a little bit of Johnny Guitar, a dash of My Darling Clementine, and lasso in a whole lot of Sam Fuller fireworks and you’ve got Forty Guns, one of the wildest and most exciting Westerns of the 1950s. Forty Guns is flamboyantly directed. The narrative obsesses around director Fuller’s concern with the threat posed by woman and love. As Griff Bonnell (Barry Sullivan) and his brothers ride a buckboard across an open stretch of land, he pulls up on the reigns and suddenly exclaims, "Whoa." The exclamation implies both danger and desire, as Fuller crosscuts to horse hoofs, Jessica Drummond (Barbara Stanwyck) draped in black, shoulders back, riding high in the saddle on a white stallion. Her face is one of contradiction: hard but delicate like porcelain. Behind Jessica gallop forty guns. She’s a dominating matriarch, another Joan Crawford-type, who has a bad evil brother (John Ericson). In the ideology of the 1950s, she has to be knocked off that horse. The town crooner, Fuller’s version of a Greek chorus, defines the narrative’s terms: "She’s a high ridin’ woman with a whip . . . But if someone could break her and take her whip away, someone big, someone strong, someone tall, you may find that the woman with a whip is only a woman after all." Griff Bonnell (a former Dodge City marshal whose characterization reworks the Wyatt Earp myth) will take away that whip, but is it, ultimately, safe to do so? He’s a peace officer sent to Tombstone to arrest outlaws wanted by the government. During his stay he tangles with Jessica’s brother, Brocky. In a wonderfully flashy scene, Sullivan displays his manliness, his ability to "break" Jessica by breaking Brocky. Her brother, having just wounded the town marshal (Hank Worden), sways in the middle of the street, his gun at his side, challenging Bonnell, who with steadfast calm marches toward him. Fuller’s comic book montage is wonderfully wild: close-ups of Bonnell’s boots, his right eye, left eye, his gun tucked above his belt buckle, mixed in with Brocky’s dismay at the man’s persistence. Bonnell, untouched, pistol whips the outlaw in the middle of the street. Jessica is outraged, but she admires Griff’s ability and after he saves her from a terrible dust storm, she wants him. But Bonnell keeps his distance as her wild brother and his own fear of intimacy come between them. Fuller, too, doesn’t trust love. In several of his films, the director melodramatically mixes his modes (romance and action), shifting from one mood to another in order to shock us and to destabilize the notion of communion through love. Old field hand Ned Logan (Dean Jagger) is a loser in love. In a painful moment, he confesses in front of Jessica and Bonnell his life-time longing for Jessica. Her eyes dipped in solemn anger, Stanwyck adopts her noir face of cold impassivity, and remains distant from his avowal. Bonnell, slumped at the piano, looks away. Logan despondently leaves and Jessica turns to Griff and freely admits that she feels about him the way Logan feels toward her. Bonnell says nothing and then a gentle thudding like window shutters knocking in a light storm breaks their intimacy. They leave the study and open a door. Logan has hanged himself: his boots and spurs sway and scuffle against a wall. Later, love kills again as Wes Bonnell (Gene Barry) invites brother Griff to kiss his bride. Griff bends over, a shot cracks, and Wes falls down, dead. Will Griff give in to the dangers of love? He decides, apparently, not to, rejecting Jessica because he has to kill her brother for killing Wes. In a finale that has in recent years been stolen by a spate of action films, including Another 48 Hours, Brocky holds a gun to his sister’s head as he tries to escape a hanging. He yells at Griff, "Let’s see you shoot her," and Bonnell coldly and accurately does! Jessica moans, turns limp, and slips slowly to the ground. Brocky, in a close up, looks incredulously stunned and then Griff keeps firing, zipping the gun out of Brocky’s hand, slamming a bullet in his belly. The dying gunman, with typical Fullerian irrationality shouts, "I’m killed, Mr. Bonnell. I’m killed." Griff empties his gun and with precise, short strides walks over to the Drummonds. Void of tenderness, he says, "Get a doctor. She’ll live." But did he want Jessica to live? Maybe, at some deep unconscious level, he wanted to kill them both.